pksd1 wrote: Placed an order for "J-Plug - J1772 40 Amp Plug" with QCP. Looking forward to getting my blink EVSE fixed. Hate driving my backup ICE car. No word from Blink support, after initial contact !! No chance of using your portable EVSE that came with the car? TonyWilliams wrote: I can absolutely guarantee that our J-Plug cable is the most flexible and lightest of any 30 amp or higher rated cable. Is single #12 ground legit for 40 amps? NEC calls for #10. There is also a rule for up-sizing the grounding conductor when the current carrying conductors are oversized relative to the OCPD, unsure if it applies here due to 2x#12s. Ah OK. In that case it may pay to have your portable EVSE upgraded by evseupgrade.com at some point in the future. You can get a pigtail to fit the 6-50 220v outlet therby having a backup to your dedicated EVSE. I never missed a beat when my Blink started acting up. I've used the 240v capability of my portable EVSE at many locations (mostly campgrounds). It's a good upgrade. Unfortunately my LEAF is a lease, not sure the dealer would appreciate me messing with the original charger when I turn the car back in next year. Opened the front panel on the EVSE. Does not seem too complicated to change out the charge cable. I hope the new cable arrives by Wednesday as I am off from work that (Veteran's day). Nope, shouldn't be too hard. The only out of the ordinary things are you want the ground wire to be the longest and the pilot wire shortest, and as you can see they put a "break away" female/male connector there. 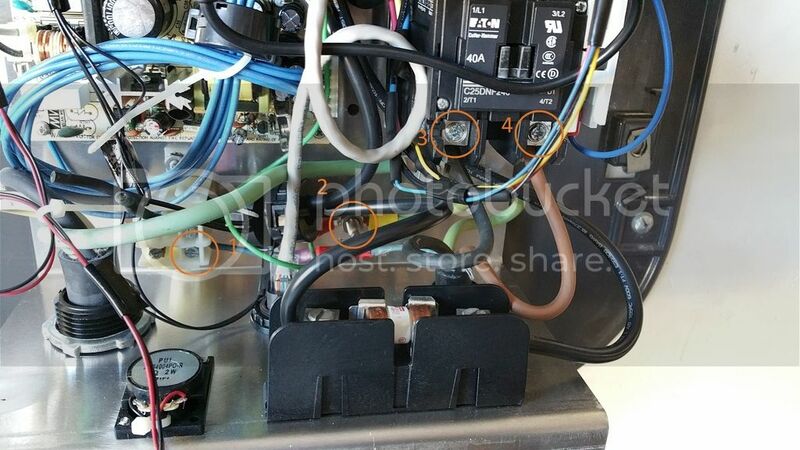 These things are done so that if for some reason the car rolled away while charging, or for some other reason the wire got pulled on the pilot would break first shutting the relays off and then ground stays connected the longest. QueenBee wrote: Nope, shouldn't be too hard. The only out of the ordinary things are you want the ground wire to be the longest and the pilot wire shortest, and as you can see they put a "break away" female/male connector there. These things are done so that if for some reason the car rolled away while charging, or for some other reason the wire got pulled on the pilot would break first shutting the relays off and then ground stays connected the longest. Always put in Park and set the emergency brake. There is an old thread where someone apparently did not do that and inadvertantly left the LEAF running in Ready mode. LEAF did not move because Creep was offsetting slope of driveway. When LEAF high voltage pack disconnect happened the LEAF rolled down the sloped driveway and took out a fence. Fortunately no people were hurt. But that error could result in fatalities.